“In The Night Kitchen” is one of the most unusual books I chose to include in my 55 Classics. It is unusual because I’ve nearly memorized it I’ve read it so many times and it’s unusual because it is just a picture book. If people know Maurice Sendak’s name, they usually associate it with Where The Wild Things Are. While I also love that book, I have reasons to prefer Night Kitchen. ITNK is part comic strip part children’s story, part nostalgia and part bizarre dreamscape. 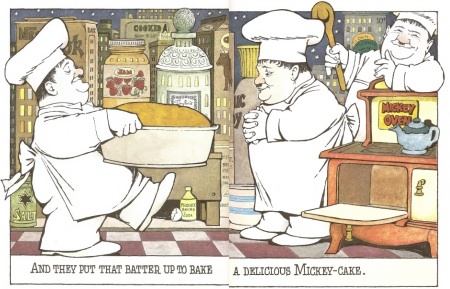 The book follows Mickey as he falls out of bed one night and into the hands of “the bakers who bake till dawn,” experiencing and triumphing through a number of otherwise horrific adventures in a place called the night kitchen. In the end he jumps off of a huge bottle of milk and slides safely back into bed. As someone who grew up addicted to newpaper comics, it is easy to see that Sendak finds huge quantities of inspiration for the style and imagery in old strips like Little Nemo. His three identical baker characters steal the identity of Oliver Hardy of Laurel & Hardy fame. Everything about this book’s aesthetic takes cue from the culture and advertisements of the 1920’s and 30’s. Sendak’s considerable illustration skills are put to good use in a totally unique setting of his own invention. The second and equally critical component to this book is its beautiful, lyrical text. It does not attempt to rhyme. Sendak even seems to intentionally avoid obvious opportunities to create rhyming texts. I believe this is because rhyming would take away from the very nature of this nonsensical story. It does not rhyme, but it flows and sings beautifully. Anyone would have a very hard time not reading this book with a sort of musical quality. My 3 year old daughter has most of the text memorized, and I hold its sing-ability as a key to her latching on to so much of its text so proficiently. Overall, I like Maurice Sendak’s work because he was an exceedingly talented illustrator who somehow retained the ability to think like a child. He stories don’t have to have strong plot lines or heavy-handed morals, but children have and always will love them. Because he validates their dreams, those by day and by night.